Of all the gin joints in all the worlds... this is one you might have to make sure you visit. Welcome to Hell, the last human station on the edge of deep space, and more particularly, welcome to Rick's Bar, the lower decks dive run by an opportunist with a moral streak, with a penchant for making money and a habit of spacing slavers. If this sounds like it has more than a hint of Casablanca about it, you're right - though if you're looking for a line by line comparison, I'm not your man, being one of the few never to have seen Bogart playing shell games with the Nazis. But such a part of a cultural tapestry as it is, you can tell there's a connection, and you can feel the love of the author for the movie. This Rick is a dangerous type, he's Lupan, the part-human, part-wolf DNA species that also features in Bonnie Milani's Home World (reviewed on this blog here). This story is set in the same universe, but at the other end, far from the events in the novel. One of the notable parts of that novel was the way in which it expressed different forms of communication, the Lupans there being able to tell a lot from people's scent. And so it is here, with Rick's nose able to sniff a path through the dangers of a space station built on lies, power plays and illicit deals, even through the gut-burning alcohol he serves to the surly mob he calls his customers. Then in through his door walks the woman who is going to change his life, or maybe get him killed. Bonnie Milani crafts a sleek, taut novella here. It's not too long, you'll zip through it quickly enough, not least of all because the writing makes you want to keep turning the pages. I loved Home World, with its broader canvas and bigger story but this is more tightly written, focused sharply on its end goal. It's witty and sassy, with the sense that Rick could as easily punch someone or kiss someone on the next turn of the page, endlessly dancing on the edge that divides success and disaster. In the end, I heartily recommend you give it a try. It could be the beginning of a beautiful friendship. 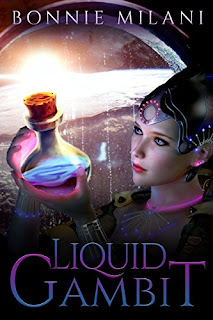 Liquid Gambit is available on Amazon.